Little Mink loves her Caboodle. In fact we all love it !!! And what a saviour the Caboodle has been for us. Particularly Angel – our older cat who very much appreciates some free time away from Mink. When Mink first came into our home – an extraordinarily, lively kitten – it somewhat upset Angel’s generally quiet life. Mink, being an inquisitive, and highly energetic kitten would continually f…ollow Angel around the house wanting to play, jumping on her at every possible moment, giving her no peace at all. Angel was becoming very stressed and we were very worried about the whole situation, as we loved them both. What could we do? Did we have to put Mink up for adoption? Something we didn’t want to do. We even called in an animal psychologist for advice. 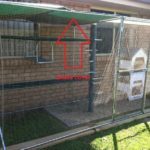 Finally we purchased a Caboodle that provided an answer to some of our problems giving Mink a safe, stimulating time outside and some quiet time for Angel. Mink loves time in the Caboodle watching the birds when they come to feed in our backyard and us feeling assured that she is safe and out of mischief if she was allowed to freely roam. She is still a naughty kitten but slowly growing up. 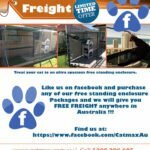 We really don’t know what we do without our Catmax Caboodle.